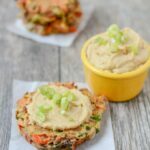 This recipe for Savory Vegetable Pancakes is an easy, kid-friendly way to add more vegetables to lunch or dinner! It’s been so long since I made these little veggie cakes that I almost forgot to share them with you! That would have been tragic because they were actually quite good. I had a tough time deciding what to call these – they’re kinda like cakes, kinda like pancakes, kinda like fritters…you get the idea. I went with pancakes because they’re a little more fluffy than crispy…but they’re not the kind of pancakes you’d want to top with syrup. Basically, these were an attempt to create a healthy vehicle that could be used to transport hummus into Squish’s mouth. I think I’ve mentioned before that Squish will eat pretty much ANYTHING that’s covered in hummus. Right now that’s the easiest way to get some veggies into him…but steamfresh veggies dipped in hummus gets a little old, even for me. So, I set out to create a pancake-type thing that I could top with hummus, cut into pieces and let him go to town on, while still getting some veggies at meal time. If you or your kiddos aren’t fans of hummus you could try a different sauce like tzatziki! If you’re using veggies that you’ve grated, be sure to wrap in a towel and squeeze to remove excess moisture before starting! Drop by 1/4 cup scoops onto a greased, heated skillet. Let cook over medium heat for 3-5 minutes, flip once, press gently to flatten and cook another 3-5 minutes. Serve warm or cold, topped with hummus. Pretty easy right? Be sure to finely dice any veggies you’re using and if you shred veggies like carrots and zucchini, wrap them up and give them a good squeeze to remove excess moisture! Thanks to all the veggies, these won’t be completely fluffy and dry inside like a traditional breakfast pancake but leave them in the skillet long enough to brown nicely on both sides and cook through the middle. We enjoyed these both warm and cold. Take your pick! 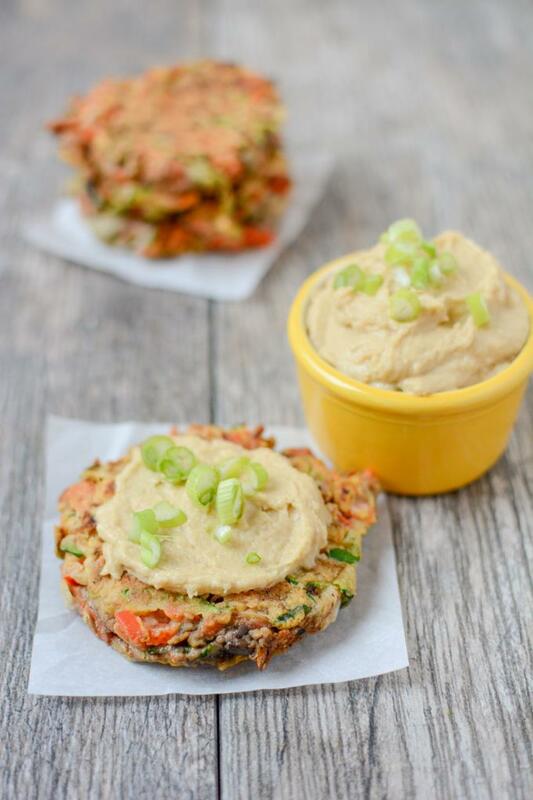 Serve these Savory Vegetable Pancakes from @leangrnbeanblog topped with hummus at lunch or dinner! My mom used to make these when I was a picky lad. She called them “Japanese pancakes” (I have no idea why). But its led me to usually favor savory breakfasts. And these look so easy! Yum! 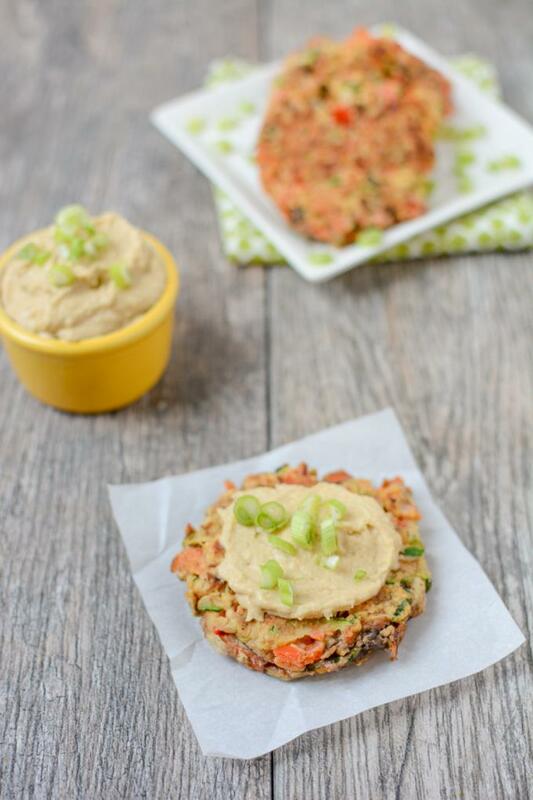 I’ve made zucchini pancakes before but I love the idea of adding more veggies and the hummus as the topping! That’s so great he loves hummus so much! Sounds good! can i sub whole wheat flour with oat flour?